It’s true that only you know what’s going on in your mind, but that doesn’t always have to be the case and shouldn’t always be the case when it comes to communicating with your business team. When planning ahead and brainstorming business goals, it’s imperative that you allow your employees a glimpse into the fire that keeps you thriving. Sharing your vision with employees, whether small-scale or large-scale, will reinforce team trust and show them that you care deeply about their opinions. In doing so you model the importance of two-way communication pathways, thus increasing a sense of appreciation and enhancing motivation to exceed the goals you collectively set forth. Equally, there’s incredible value in inquiring into the mindsets of your employees. Opening the marketplace of ideas will produce an overarching sense of appreciation, respect, and admiration for one another as a team. As we’ve all personally experienced: when an individual’s ideas are appreciated, it will reflect in their performance. Divvying responsibilities is one of the most efficient ways of getting a project across the finish line. When each teammate is able to harness ownership of a moving piece from start to finish, it will only increase accountability by boosting not only excitement but pride as well. Projects will have an impressive fluidity to them with every angle covered by professionals offering a combined multitude of skills and sticktoitiveness. Further, as you begin to delegate tasks, don’t forget to include yourself in the fun! Watching a good leader lead is perhaps one of the most formeable experiences a professional can have. As the saying goes, lead by example. Each and every person should feel integral to the team, because after all, they are! As a quick and easy team exercise, perhaps try having your employees post on the GetAssist’s Employee Engagement App regarding their proudest moments while undertaking a large responsibility in their portion of a project. It’s one thing to discuss means of reaching goals and another thing to actually implement strategic methods of reaching them. It is best to be specific with goals, with specific plans for hitting the benchmarks within each goal. You could start by engaging in a brainstorming session with the end-in-mind being setting goals and mapping them out. Try setting large, general goals at a few different levels: individual, team, and client (or recipient of your product/services) – then, tactically discuss how each goal can start to be satisfied with smaller goals along the way. In doing so, you’re evenly distributing checkpoints across the timespan of a project, which will keep the spark live and prevent burnout. One of the best means of staying on track to reach a goal is to determine various “check-in dates”, according to Kelly Services Inc. By marking actual dates on your Employee Engagement App shared calendar in which the entire team will join together to review progress, you are locking down precious time that should be spent exactly in this way! Further, you’ll want to brainstorm some anticipated curves in the road and how you might remedy them if they do occur. This will ensure that you have a game plan, even if plan “A” goes a bit astray. Use the Project Log feature with your Business Membership to have your team members check off each step of the way to your ultimate outcome. Just as you occasionally need your own thinking space to get the creative juices free-flowing again, so do your employees. As a leader you likely have folks tapping on your door or buzzing your phone all throughout the day, but sometimes you just need to take a step back and “get in your zone” (even if it means temporarily backburnering a few things). Taking the time to focus on your creative passions is not only imperative to mental health, but also to productivity. By understanding and implementing this, you are equipping yourself and your team with the ability to be honest with themselves (and each other) to address stagnancy head on, before it affects quality of work. Goals come more into focus when we are thinking clearly, so do what you can to help clear any mental fog when you detect it within an employee. 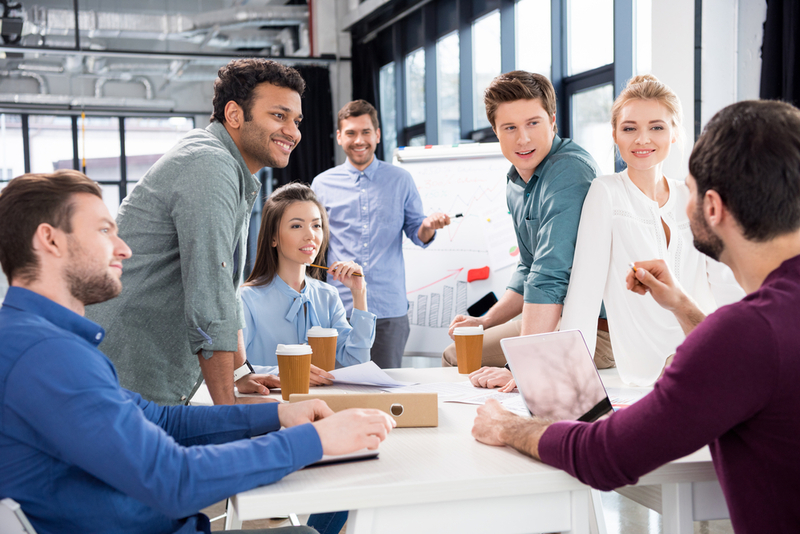 As a quick recharge activity, your team could take a break to discuss their creative strengths as a team, then, post their thoughts in the Business Community on GetAssist to get further insight from other professionals. This would be an innovative and therapeutic way to hone in on creativity and learn from growing professionals similar to themselves. Encouraging and facilitating feedback is a great way to maintain a productive and healthy working relationship. 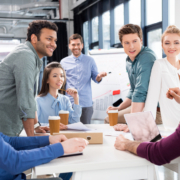 Frequent feedback benefits all members of a team by serving an open, free-flowing dialogue and ensuring that each individual is comfortable sharing their thoughts in your unified environment. If feedback is incorporated at all times, it will become a staple of the culture, thus promoting and strengthening the very relationships that make goals easier to meet and exceed. Too, it makes any potentially critical comments easier to process for teammates on the receiving end. With each of your employees feeling comfortable within your office community, goals will shine at the forefront in a given conversation (even when discussions contain cons alongside pros). Try taking feedback to the next level by compiling a quarterly newsletter to highlights the many employee jobs-well-done via GetAssist’s Employee Engagement app. Taking the time to reflect on completed projects will promote communal improvement and serves as a method to fully review the steps of a task from start to finish. When reflecting as a team, be sure to make note of things you’re proud of, as well as things that could be improved for future goals. This is a way to reward yourselves while simultaneously cultivating a forward-thinking mindset. After all, forward-thinking is one of the most valuable characteristics of a team and enhances goal attainment. If while reflecting you come up with a new idea that will benefit colleagues or other professionals, be sure to mention them in your private Business Community on GetAssist. The next time your team is all together, have everyone write down a motivational saying, or a joke, or an inspirational quote, etc. Then, fold the pieces of paper and place them in a jar for safekeeping. The next time your team hits a bump in the road or you find yourselves short of goal benchmarks, just pull a piece of paper from the jar and read what it says. Have the individual explain the meaning of what is written and why they wrote it. This is a way for the team to gain insight into the mindset of other teammates, thus providing alternative ways of thinking and sparking all different types of encouragement and motivation. With a team that cares to learn about the thought processes of one another, goals will remain intriguing and have an ever-evolving inspiration behind them. No matter the needs of your team, GetAssist is here to support you all. We want to see you and your team succeed, but most importantly, we want to help provide happiness and job contentment across the board. If you haven’t already, be sure to download the GetAssist Employee Engagement App! We’re excited to help make your goals come into focus.